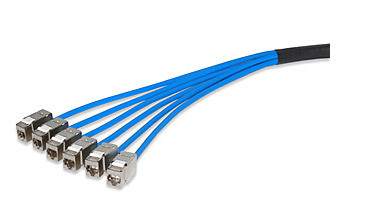 Category 6 High-Density Feed-Thru Panels can be used when connecting equipment in a telecommunications room ands necessary to cross-connect using patch cables, in order to interface to the distribution cabling system. Signamax High-Density Feed-Thru Patch Panels provide 24- and 48-modular coupling ports, while maintaining category 6 performance. Panels are available in either an un-screened or screened versions and are provided with a newly designed cable management bar that easily mounts to the back of the panel without the need for mounting screws. This cable management bar features improved cable routing and strain relief.